As people age, it’s not uncommon for them to eat smaller amounts because they are less active and require fewer calories. However, they still need to eat three nutritious meals a day to prevent vitamin deficiency and malnutrition, which can lead to serious and even life-threatening conditions. Complications from illnesses, even the common cold, can become much more severe in seniors as a result of poor nutrition. According to a 2013 Community Health Survey by Statistics Canada, 34% of seniors are at nutrition risk, with women (38%) at a greater risk than men (29%). You or an aging parent may be happy and satisfied with a cup of tea and a piece of toast or some cheese and crackers but the body requires protein, vitamins, minerals and salts to stay healthy. And because the body absorbs fewer nutrients as we age, seniors especially need to eat a nutritious diet from the four food groups – vegetables and fruit, grains, milk and milk alternatives, and meat and meat alternatives. 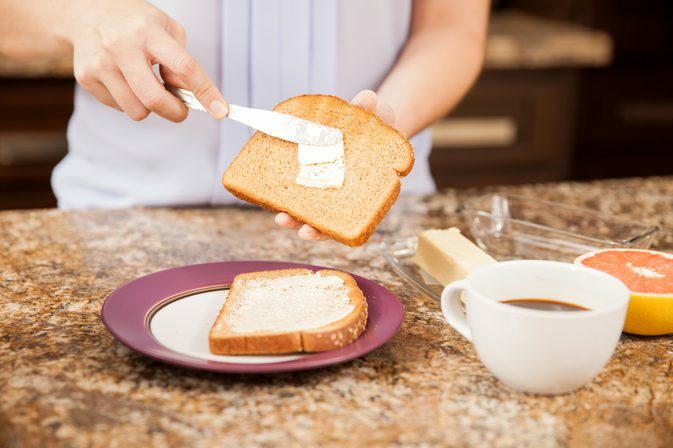 The ‘tea and toast syndrome’ refers to malnutrition in seniors due to their lack of desire or inability to prepare and/or eat proper meals, relying instead on simple fare such as tea and toast. Loss of taste and smell: The senses diminish with age, especially the sense of smell, so eating may be less appealing and enjoyable. The number of taste buds you have also decreases. Sensitivity to sweet, salty, sour and bitter flavours declines. In addition, you produce less saliva and the resulting dry mouth can affect your sense of taste. Medications: Some medications can affect your ability to taste and smell, decrease your appetite and ability to absorb nutrients, or cause the body to lose nutrients. Dental problems: Seniors with bad teeth or ill-fitting dentures may have difficulty chewing and swallowing food. Health problems: A chronic illness or other health concern can make it difficult to eat or cause a lack of appetite. Dietary restrictions that limit salt, fat, protein or sugar may make food bland and unappealing. Memory problems: A decline in mental functioning can affect a person’s ability to shop, prepare meals and keep track of how much they eat. If the condition progresses to dementia, eating and swallowing become more difficult. Lack of social contact: Older adults who eat alone may not enjoy mealtime and lose interest in cooking and eating. Seniors caring for a spouse with a chronic illness may also not eat properly. Disability: Seniors who have a physical disability may not be able to shop or cook for themselves. Depression: Grief, loneliness, failing health, lack of mobility and other factors can contribute to depression and cause a loss of appetite. Alcoholism: Drinking too much can affect digestion and the absorption of nutrients, as well as decrease appetite. Muscle weakness or loss of strength. This could lead to falls and cause broken bones or fractures. Ask them what they eat and spend time with them during meals to observe their eating habits. Help them monitor their weight at home. Check their refrigerator and pantry to find out the type and quantity of food they have. Encourage healthy food choices for meals and snacks. Snacking on a piece of fruit or cheese, a spoonful of peanut butter or a fruit smoothie is a good way to get extra nutrients and calories between meals. For a nutrient-rich diet, spread peanut or other nut butters on toast and crackers; sprinkle finely chopped nuts or wheat germ on yogurt, fruit and cereal; add extra egg whites to scrambled eggs and omelets; use whole milk; add cheese to sandwiches, vegetables, soups, rice and noodles. Use lemon juice, herbs and spices to flavour bland foods. If they have trouble chewing raw vegetables or fruit, they can juice or mince fresh produce or use canned or frozen fruits and vegetables. Use nutritional supplements such as multivitamins with a doctor’s approval. Consider using a meal replacement supplement suitable for older adults but these should not regularly replace well-balanced meals. Speak to their doctor first. Make homemade soups which can be just as nutritious as a meal. If your loved one is not feeling well or unwilling to eat, meat and vegetable broths are a temporary option that may be better tolerated. Ask a doctor or pharmacist if your loved one’s medications could cause a loss of appetite. If they are depressed or an alcoholic, help them seek treatment. Speak to their doctor if you observe any signs of poor nutrition. You might also ask for a referral to a registered dietitian. Encourage them to exercise to improve their appetite and keep bones and muscles strong. Try to encourage social activities and meals with friends and family. Drop in for meals or invite them to your home or out to a restaurant. Perhaps find programs where they can socialize and eat with others, such as at a community or senior’s centre. Provide cost-savings tips if they are concerned about spending money on groceries. Make a shopping list, check store flyers and choose less expensive brands. You could also consider a meal delivery service like Meals on Wheels. If you can’t always be around to make sure your loved one is eating well, Bayshore Home Health can provide assistance with grocery shopping, meal preparation and light clean-up. One of our skilled and compassionate caregivers will come to your loved one’s home and include them in the making of a hot, nutritious meal if they’re able. To find out more about the meal preparation and home care services we offer, call us at 1-877-289-3997 or email us today at clientservice@bayshore.ca.